Awhile back I went through some boxes in the basement and came across my old Westerner cup. 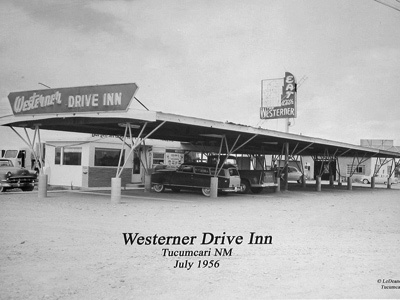 Growing up in Tucumcari, the Westerner Drive Inn was the place to be on any given night for Rattler Burgers or Westerner Tacos. Oh, how I miss those tacos . . . The Westerner is no longer in business, just a shell of a building left standing, but every time I think about it I get nostalgic. There are a few places in New Mexico that I find myself reminiscing about. 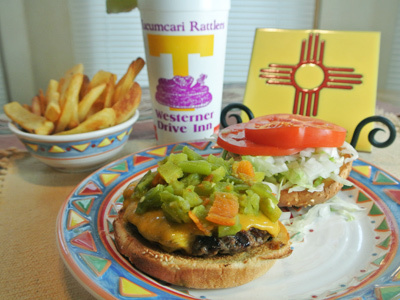 Blakes Lotaburger has been a New Mexico tradition since the 50’s for those Lotaburgers with green chile, and just recently Kat and I went to the Frontier Restaurant down on Central in Albuquerque which has been around forever. It’s located near the UNM, a few blocks from where Joe and I had a little apartment when he was going to college. All those years we lived so close and I never ate there even though it was famous for it’s New Mexican cuisine. I thought I had all the time in the world to experience The Frontier among other things but time and circumstances changed. 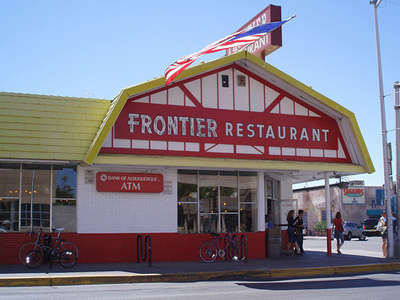 The Frontier is known for their jumbo cinnamon rolls, green chile cheeseburgers and Frontier burritos as well as other breakfast, lunch and dinner specialties. 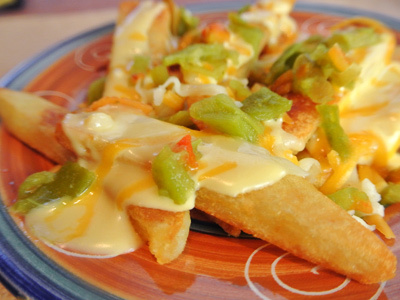 We each had a Frontier Burrito with fries on the side generously sprinkled with melted cheese and green chile. It was an awesome experience all around, especially the atmosphere, Southwest art deco and food. So if you are ever in the neighborhood, pick up a Lotaburger or stop by the Frontier for a giant burrito. Not quite the Chili and Cheese fries you’re used to, huh! 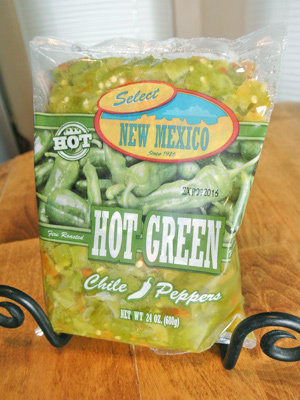 I found these frozen bricks of NM green chile at “Sprouts Farmers Market” that looks and tastes just like the chile you’d find on a Blakes Lotaburger and the fries at Frontier. 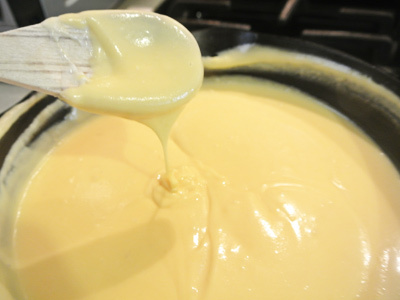 So to make the cheese sauce, first melt 2 tablespoons of unsalted butter. 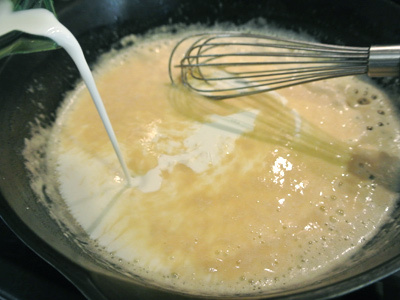 When the butter has melted, add 2 tablespoons of flour and stir to make a roux. Once it begins to bubble, begin pouring in the milk. Whisk it the whole time you’re pouring. As it heats up it becomes a creamy saucey gravy. 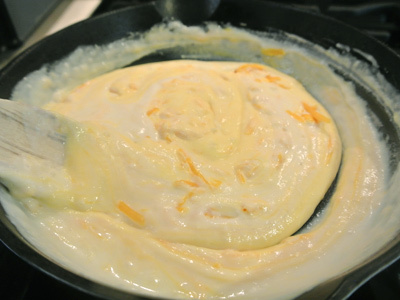 Begin adding the cheese, a handful at a time all the while stirring while it melts. Now it’s time to taste. Salt and pepper until it tastes just right. 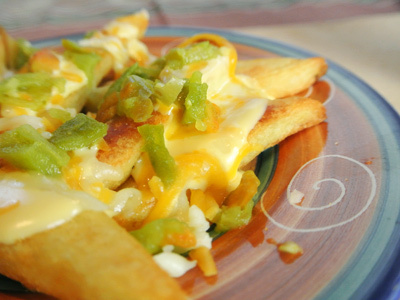 Drizzle over your favorite fries and sprinkle with chopped green chile. Now that’s some awesome fries! 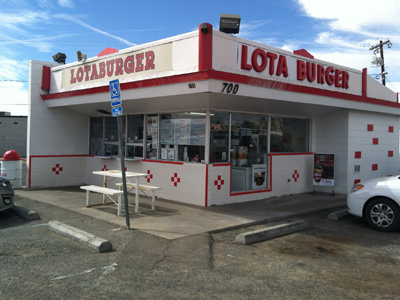 Next up, Blakes Lotaburger, it’s a Lota Burger! 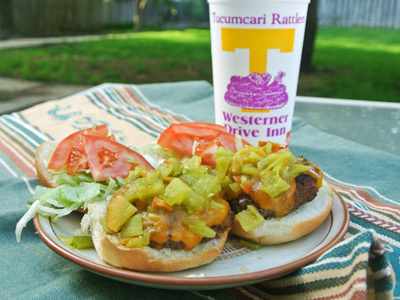 Or if you need something lighter, an Itsa Burger might be just the thing, just don’t forget to add the green chile! Since the 50’s it’s been a New Mexico tradition. 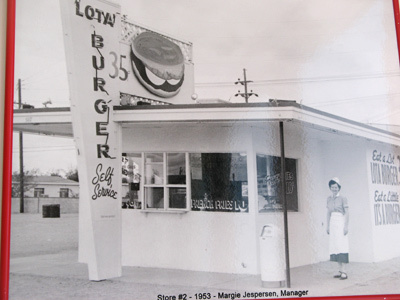 The Westerner in the 50’s, before I was born btw . . . This is the way I will always remember it! 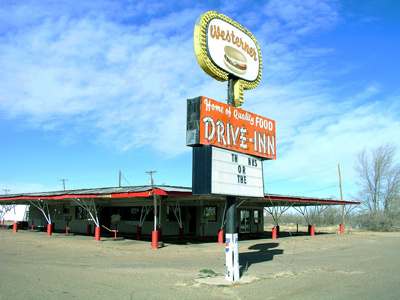 I miss The Westerner most of all with memories of Westerner tacos and lime cokes! Prepare frozen fries according to package directions. 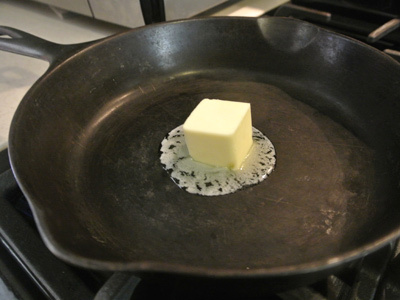 Melt butter in a heated skillet. 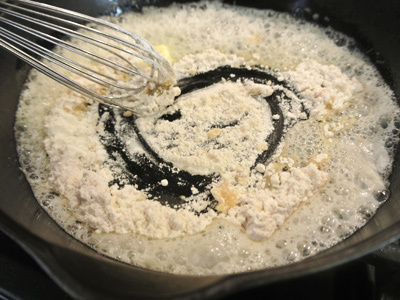 When melted, stir in the flour and stir the pan until the mixture begins to bubble. 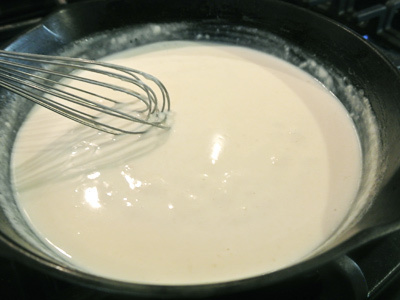 Begin pouring the milk all the while stirring until the sauce begins to thicken. 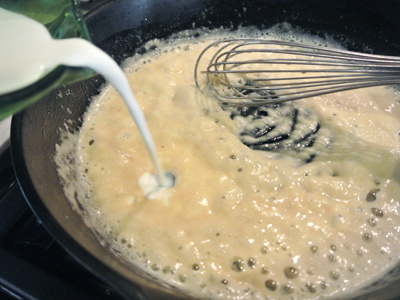 As the mixture becomes creamy begin to add the cheese, a handful at a time, stirring all the while until the cheese has melted. Salt and pepper to taste. 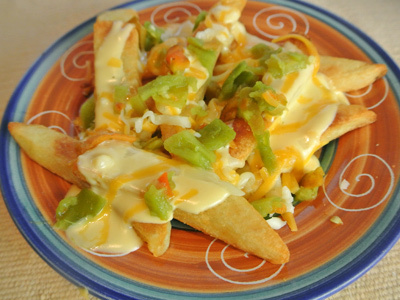 Arrange fries on a plate, pour cheese sauce over fries and sprinkle with diced green chile.